It’s alarming that over 250 million children suffer from malnutrition, and 55 million of those children have acute malnutrition. Few hear about it in the mainstream media, unless a famine is declared and hits the ever-changing news cycle. Malnutrition relates to hunger but is more a result of a lack of essential nutrients in the daily diet. Growing children need to consume about 40 unique vitamins and minerals with every meal to develop into their full potential. The lack of dietary diversity, rooted in poverty, conflict, and/or natural disaster, dooms a large swath of the world's children to a life of limited cognitive and physical development, leading to bleak and often miserable outcomes in all areas of life. The hope of a bright and prosperous world for everyone, therefore, depends on more healthy and vibrant children everywhere. Before the launch of therapeutic milks and Plumpy’Nut® by the French company Nutriset in the 90s, treating starving, malnourished children was mostly a hopeless endeavor. Plumpy’Nut® is a portable fortified peanut paste that doesn’t require refrigeration or pre-mixing with water to deliver all of the nutrition a severely malnourished child needs to recover rapidly. In 2007, Navyn Salem, then a mother of four young daughters, felt a deep calling to expand the reach of these lifesaving ready-to-use foods. She was a native New Englander but her father’s family hailed from Tanzania and in that country she had seen first hand malnutrition’s devastating impact. She founded Edesia in 2009 as a nonprofit social enterprise in partnership with Nutriset. Without a background in manufacturing or solving global health problems, she took on the challenge because she wanted to make sure no mother experienced the searing pain of losing a child to something as preventable as malnutrition. Edesia’s state-of-the-art Rhode Island factory, with Navyn Salem as the CEO, now manufactures a full line of Ready to Use foods, or RUFs, for humanitarian aid agencies designed to treat and prevent malnutrition, namely: Plumpy’Nut®, Plumpy’Sup™, Plumpy’Doz™ and Enov’Nutributter®. Through community health networks, humanitarian aid workers deliver these portable lifesaving and life-sustaining foods into the hands of malnourished children in developing nations all around the world. Since 2010, when the first RUF rolled off Edesia’s production line, over 8 million malnourished children in over 50 countries have received their miracle products. Sanaica — Sanaica from Haiti is just one example of millions of what life after Plumpy’Nut looks like for a severely malnourished child. After Sanaica’s mother died of tuberculosis, her father didn’t know how to care for her. She got so sick, her desperate father took her to a community health clinic, where she was diagnosed with severe acute malnutrition, a life threatening medical condition. She received the gift of lifesaving Plumpy’Nut for free and as a result recovered her life and good health very quickly. Help The Mothers' Day Movement generate funds to aid Edesia’s mission to help end childhood malnutrition worldwide. We need your help to fill a container with 1,000 boxes of Plumpy’Nut. It costs approximately $75,000 to make and ship this amount to reach approximately 1,000 severely malnourished children. Together, we can make a difference in honor of our mothers, sisters, aunts and friends. 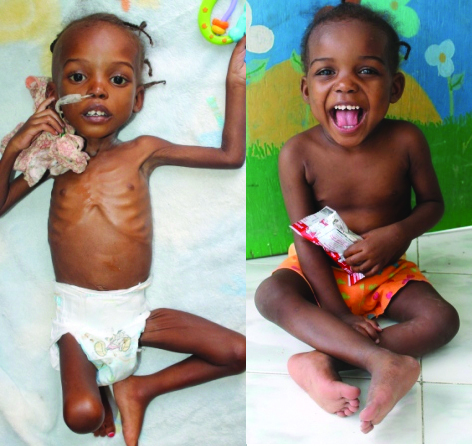 $50 helps Edesia make and ship one box of lifesaving Plumpy’Nut to help save the life of 1 severely malnourished child. $200 provides life-saving nourishment for 4 severely malnourished children. $1,000 provides life-saving nourishment for 20 severely malnourished children.